Brake service and repair is a fact of life in Fremont. Driving on I-880 or I-680, and in Bay Area traffic in general, will cause your Mercedes brakes to undergo accelerated wear. Whether you drive a C-Class Cabriolet or Mercedes-Maybach S600, your vehicle brakes will need regular brake service. 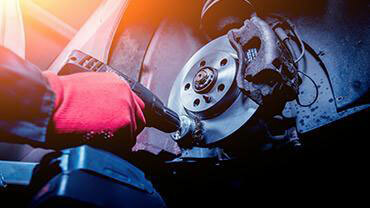 At Fremont Auto Center we are Fremont Mercedes Benz brake service and repair specialists. At Fremont Auto Center we use Original Equipment Manufacturer (or better) quality parts, and our Mercedes specialists can have your vehicle’s brakes serviced, and have you back on the road, usually the same day. At Fremont Auto Center our nationally ASE certified technicians can handle all aspects of brake service and repair – whether it’s the hydraulic brake fluid, brake master cylinder, the brake pads that need to be replaced, or the problem is brake pedal, power brake booster, brake calipers, disc brakes, or electronic anti-lock brake sensors – we will have the problem diagnosed and repaired in a timely manner. In our experience, the most common Mercedes brake service items include: brake pad replacement, brake hose replacement, brake rotor replacement, and brake fluid flush. Whenever you bring your Mercedes-Benz for brake service, we will also perform a complimentary inspection of belts, hoses, tires, adjust tire air pressure, and will look at other subsystems of your Mercedes to ascertain the overall health of the vehicle. And of course, if your vehicle indicates that its brakes need service, bring it to Fremont Auto Center. Brake issues can be a safety hazard – please skip the online appointment process and call the shop directly.